Beading Divas to the Rescue goes dark during July but we are still working behind the scenes. Lizzie puts charming paw charms on bracelets and preps for sale plus sorts beads and manages the inventory; Cynthia and Loren photograph bracelets for Etsy; Cynthia and Karyn upload bracelets to Etsy; Mary Jo wraps and labels the bracelets for shipping and sorts beads, cuts wire. Lizzie and Mary Jo love to sort beads and should be members of BSA (Bead Sorting Anonymous); Karyn not so much. There is plenty to keep us busy. Gail is truly on vacation with her family. 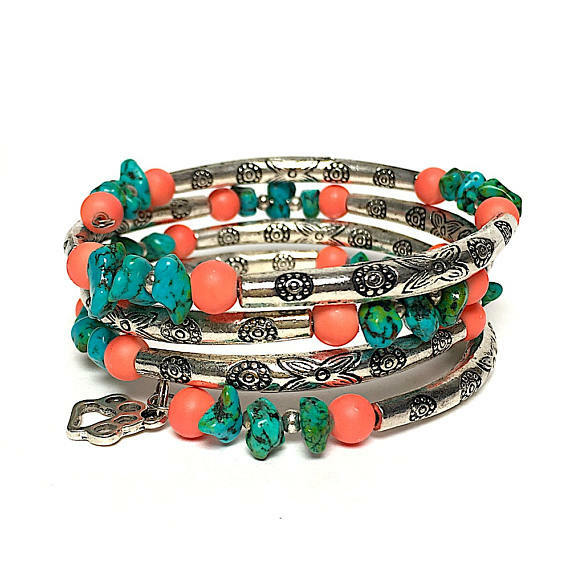 While we do a lot as volunteer board members – our circle of bracelet makers grow. Individuals and a gaggle of women make bracelets for us with mostly their own bead stash; otherwise we could not keep up with the supply and demand. Green Valley Joan has been here since the beginning and still occasionally shows up with a stunning batch of bracelets. 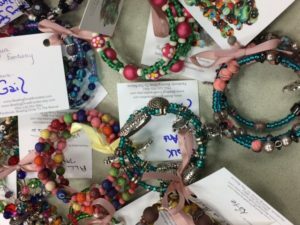 Sandra & friends create dazzling bracelets locally. Sandra’s sisters & friends in L.A. make beautiful bracelets. Chris W. and friends made 60 bracelets for her 60th birthday. Debbie F. in New York surprised us with her rendition of bracelets which is a nice addition to ours. Plus: Alta, Monica, Ellen and the annual rendezvous with the Desert Crones. Our bracelet making sessions known as “bees” have been populated by Dawne, Dawn, Anne Marie & Gracie, Sandra, Michelle, Alice, Susan, Carol, Doe, Noni, the line dancers, Joan, Diana, Mary, Tucson Kate, Seattle Kate, Kathy, Helen, Gwenn, Gerry, Guadalupe, Randee, Heather, Jean, Anne. great work everyone – almost makes me wish I lived in Tucson so I could be there and know you all – and make bracelets too. I own a few of your incredible bracelets and have given them as gifts to the special women in my life – including my granddaughter who is very opinionated and fussy about what she wears – thanks to you all and continued greyt (Greyhound spelling) work ♥ Love you all and always adopt and never shop – I have 2 Greyhounds, 5 cats all adopted as adults and 7 parrots unwanted – if I had more money I’d buy more bracelets. I’m so happy to be a part of this group!!! Beading Divas are a larger clan than I knew! Thanks for all the great work to help the critters.